Liturgical Instruction: After the priest exclaims “Blessed is the Kingdom” and we have responded “Amen,” the clergy sing the following Tropar once and the people repeat it. Then the clergy sing the first half, and we conclude it. This is done every day until the Wednesday before Ascension Thursday. Troparion: Christ is risen from the dead, trampling death by death, and to those in the tombs giving life. (3x). Verse 1: Shout to the Lord, all the earth, sing now to His name, give glory to His praise (Ps 65:2). Refrain: Through the prayers of the Mother of God,* O Saviour, save us. Verse 2: Say unto God, “How awesome are your works! Because of the greatness of Your strength Your enemies will flatter you” (Ps 65:3). If the second antiphon is sung: (Refrain: Through the prayers of the Mother of God O Saviour, save us.) Otherwise we sing:Only-begotten Son..
Verse 1: God be merciful to us and bless us; make the light of Your face shine upon us and have mercy on us (Ps 66:2). 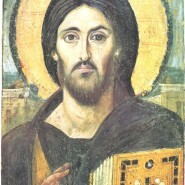 Refrain: Son of God, risen from the dead, save us who sing to You: Alleluia. Verse 2: That we may know Your way upon earth, Your salvation among all nations (Ps 66:3). Verse 3: Let the peoples give praise to You, O God, may all the peoples give praise to You (Ps 66:4). Verse 1 (Soloist): Let God arise, and let His enemies be scattered; let those who hate Him flee from before His face (Ps 67:2). Troparion: Christ is risen from the dead, trampling death by death, and to those in the tombs giving life. Verse 2 (Soloist): As smoke vanishes, let them vanish, as wax melts before the fire (Ps 67:3). Verse 3 (Soloist): So let sinners perish before the face of God, but let the righteous be glad (Ps 67:3-4). Entrance Verse (Soloist): In the churches bless God, the Lord from the fountains of Israel (Ps 67:27). Kontakion (Tone 8): Though You descended into a tomb, O Immortal One,* yet You destroyed the power of Hades;* and You rose as victor, O Christ God,* calling to the myrrh-bearing women: Rejoice! * and giving peace to Your apostles:* You, who grant Resurrection to the fallen. Instead of “Holy God…”: All you, who have been baptized into Christ, you have put on Christ! Alleluia! Prokimenon (Tone 3): Their utterance has gone forth into all the earth, and their words unto the ends of the world (Ps 18:5). verse: The heavens tell the glory of God, and the firmament declares the work of His hand (Ps 18:2). Epistle (Act 3:1-8): In those days Peter and John were going up to the temple at the hour of prayer, at three o’clock in the afternoon. And a man lame from birth was being carried in. People would lay him daily at the gate of the temple called the Beautiful Gate so that he could ask for alms from those entering the temple. When he saw Peter and John about to go into the temple, he asked them for alms. Peter looked intently at him, as did John, and said, ‘Look at us.’ And he fixed his attention on them, expecting to receive something from them. But Peter said, ‘I have no silver or gold, but what I have I give you; in the name of Jesus Christ of Nazareth, stand up and walk.’ And he took him by the right hand and raised him up; and immediately his feet and ankles were made strong. Jumping up, he stood and began to walk, and he entered the temple with them, walking and leaping and praising God. verse: The heavens shall confess Your wonders, O Lord, and Your truth in the church of the saints (Ps 88:6). verse: God is glorified in the assembly of the saints (Ps 88:8). Gospel: (John 3:1-15): At that time Jesus went down to Capernaum with his mother, his brothers, and his disciples; and they remained there for a few days. The Passover of the Jews was near, and Jesus went up to Jerusalem. In the temple he found people selling cattle, sheep, and doves, and the money-changers seated at their tables. Making a whip of cords, he drove all of them out of the temple, both the sheep and the cattle. He also poured out the coins of the money-changers and overturned their tables. He told those who were selling the doves, ‘Take these things out of here! Stop making my Father’s house a market-place!’ His disciples remembered that it was written, ‘Zeal for your house will consume me.’ The Jews then said to him, ‘What sign can you show us for doing this?’ Jesus answered them, ‘Destroy this temple, and in three days I will raise it up.’ The Jews then said, ‘This temple has been under construction for forty-six years, and will you raise it up in three days?’ But he was speaking of the temple of his body. After he was raised from the dead, his disciples remembered that he had said this; and they believed the scripture and the word that Jesus had spoken. When he was in Jerusalem during the Passover festival, many believed in his name because they saw the signs that he was doing. Instead of “It is truly…” (Pg. 507): The Angel cried out to the One full of Grace: O chaste Virgin, rejoice! And again I say, Rejoice! Your Son has risen from the tomb on the third day, and raised the dead. Let all people rejoice! Communion Verse: Receive the body of Christ; taste the fountain of immortality. Alleluia! (3x). Instead of “Blessed is He…”: Christ is risen from the dead, trampling death by death, and to those in the tombs giving life. Instead of “We have seen the true light…”: Christ is risen from the dead, trampling death by death, and to those in the tombs giving life. Instead of “Let our mouths…”: Christ is risen from the dead, trampling death by death, and to those in the tombs giving life (3x). Instead of “Blessed be the name of the Lord…”: Christ is risen from the dead, trampling death by death, and to those in the tombs giving life (3x). “Christ is risen” is sung again once (using a simple cord chant) instead of “Glory be to the Father…” at the dismissal. 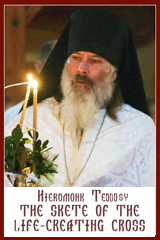 Then the Troparion “Christ is risen” is sung as in the beginning of the Liturgy, but with an additional ending. 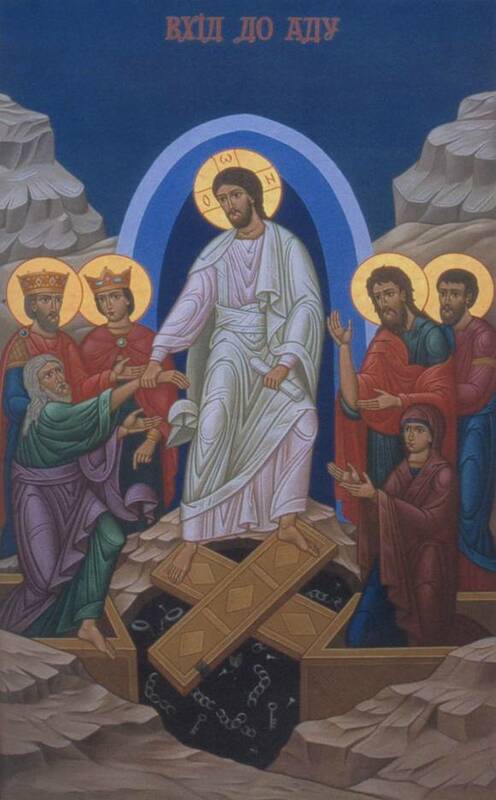 Troparion: Christ is risen from the dead, trampling death by death, and to those in the tombs giving life (3x). And to us He has granted life eternal;* we bow down before His resurrection on the third day.